You might be at home watching the news or scrolling through your social media feed and seeing the headlines for news reports that can only be something from The Onion. For those of you not familiar with The Onion, much like me when I began my undergrad at UW-Madison, it is a newspaper based on satire. Unfortunately, the headlines are true. The abortion industry and their well-financed elected pro-death candidates are pulling back the curtain and showing us what safe and rare really looks like. Not rare and not safe, but available at all stages, even up until birth, and removing protections for unborn babies who are born alive during an unsuccessful abortion. These headlines have caused an uproar in the country. I have witnessed an increase in contacts to our organization unlike any I have seen since I began working here over five years ago. I have watched as my social media feeds are filled with people posting about the absolute devastation of these laws – people I never knew feel the way I do. In the end, I believe that the extreme measures have awoken a lion and it has unleashed the people in our country who will rise in outrage over these abhorrent acts. Acts of violence to the unborn, to the mothers, to the babies who are left to die and to people who will be forced to participate in abortions against their will. Here are some easy, yet effective, steps to get involved and share your voice for those who have no voice. Share all the information with at least five of your friends. If we do not have an motivated group of dedicated pro-life activists doing all we can, you can be sure Wisconsin will be next. 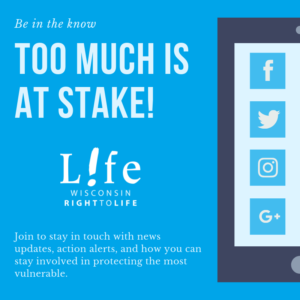 Late in the end of the legislative session in 2018, Rep. Chris Taylor introduced a bill which will effectively make those of us in Wisconsin as ill-equipped as New York when it comes to protecting the most innocent born and unborn children in our state. It is simply a matter of time, and one election away, from Wisconsin becoming New York.